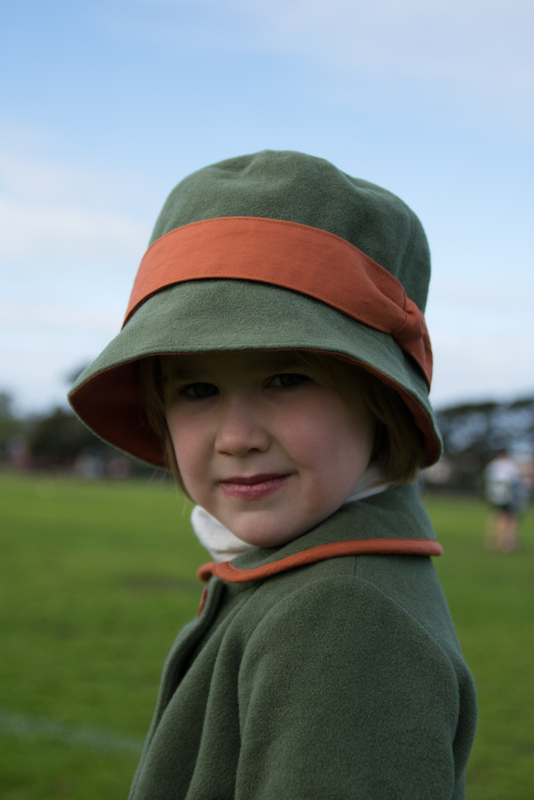 Bartacks and Singletrack: Girl's Sassy Clothes - Hat "q"
Girl's Sassy Clothes - Hat "q"
What are kids like, hey? No sooner has my daughter outgrown something that she had previously refused to wear, and suddenly she loves it?! I'd made Hat "q" twice before (here and here in Flickr) and she was all over the brown wool version recently but it was too small. I quickly got approval to make another, and yep, it could match her recent coat. When you get that kind of affirmation, you don't hang around, you get sewing! Yes - that is lipstick. A recent gift that she loves from my MIL and I'm only allowed to remove that which is all over her face, not ANY from her lips. Sigh. The hat comes from Girl's Sassy Clothes by Yuki Araki which is one of my very well used Japanese pattern books. This is one that I could happily make everything in the book. 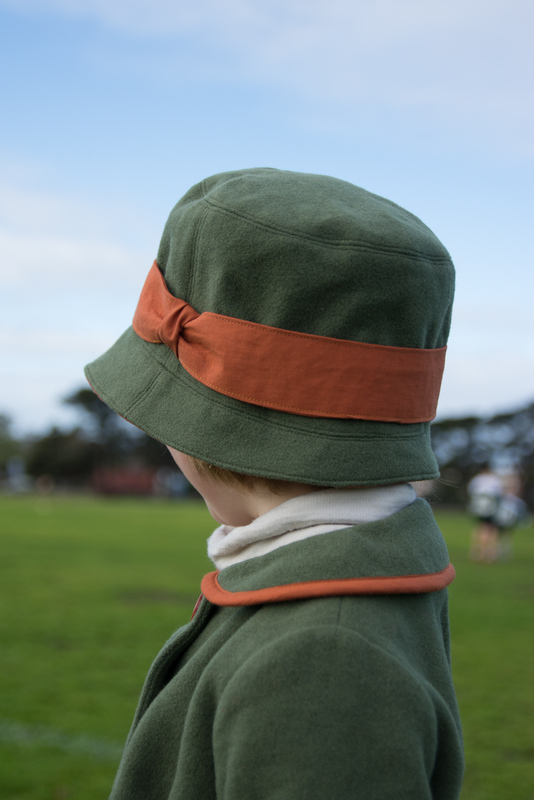 The hat comes in 3 sizes, 50cm, 52cm and 54cm. The first two I made were size 50cm. I measured her head at 52cm exactly but decided to go up to the 54cm size to avoid it being too small. That picture reminds me that I have two cuts of flannelette fabric set aside for more winter versions of the Oliver + S Music Class Blouse. Mentally added to the very long list of things I want to make. 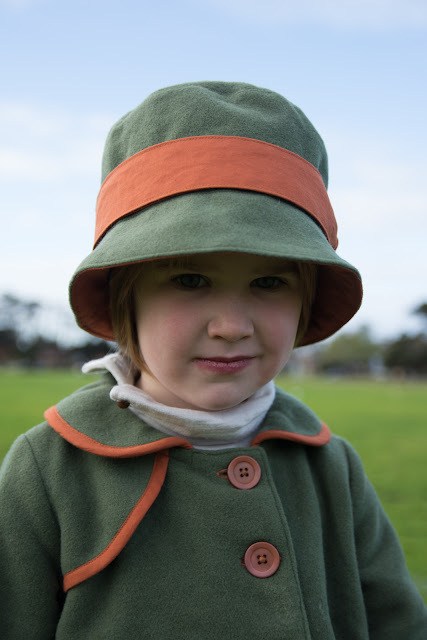 The brim is a really sweet shape with this narrow brim at the back and a lovely face shading width at the front. The brim pieces are cut on the bias and somehow this hat comes together so much more easily than others I've sewn. 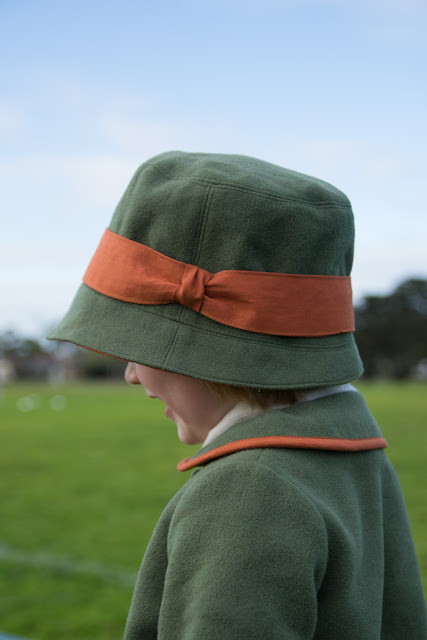 The lining is an identical, non interfaced version of the main hat. Both are constructed and then sewn together at the brim leaving a 2 inch gap to turn it all right side out before edgestitching the brim. This is a nice way to sew a lined hat without having to do any handstitching. I kept it simple on the side this time and just used a little bias tube of the same fabric to cover the join in the band. Take note: the band pieces are too short to overlap properly. I added the correct seam allowance, but the pattern shows you turning the ends of one piece in, then tucking the other inside the tube of the first. Simply not possible. These only just meet and overlap enough to be stitched. Need to add at least another 1cm to each side in order for a prettier finish. I should get around to hand stitching the band to the crown to prevent it sliding up like it has above, but also to thwart my daughter in her attempts to remove and lose the band. So there's my happy hat model and happy hat news. The sad hat news is that P's Straw Boater, which I had just entered in the Royal Show (for fun!) has had a hole chewed in it by the small furry monster (aka kitten) that is living with us temporarily. I had some leftover straw braid and thought for a moment I could redo the crown and save it, but on closer inspection he has chewed where the crown meets the lid and damaged both parts. It can be patched for wearing but it's not show worthy. Thank you. I did wonder if matching the hat with the coat wasn't a bit too much. Maybe, but I like it anyway! She is adorable! My girls always beg to wear my lipstick even though I rarely wear it myself except on the occasional date night! They also love my lip glosses which are currently all lost due to Hazel raiding my purse! The hat is darling. I can't believe how much she has grown up in 2 years. The changes are enormous! I am really seeing it with Iris now too! I'm only a once or twice a year lipstick wearer so her fascination doesn't come from watching me! It is amazing when you look back. Other people's kids seem to grow so quickly but mine it seems imperceptible. The lipstick! My two year old has become obsessed. It's lip gloss by day and chapstick at night. As she drifts off to sleep, she'll lose her grip on the chapstick and then startle herself awake trying to find it again. I hope the obsession isn't long term - we all need more rest. I think you could make it work with the bucket hat pattern. Wow, that sounds like a chapstick as substitute for dummy/pacifier! Sounds like she needs a bedside table and a gentle reminder of where a lady keeps her night things :) good luck! Thanks for the hat love. Oh wow what a great hat/outfit! She looks so prim! We've had such a hot summer, I'm already dreaming of the need for cozy layers. Isn't that always the way with the seasons. The extremes are just too much! Your Em would rock this style! PS I've been lurking here a while (after noticing you kept popping up in other sewing bloggers' comments. Haha) & am reading back posts of your blog. LOVE a good read, & loving the sewing inspiration even better. :D Thanks. Yes, my box of outgrown handmade clothes contains a few items that my little fussy girl did not like until they got too small! 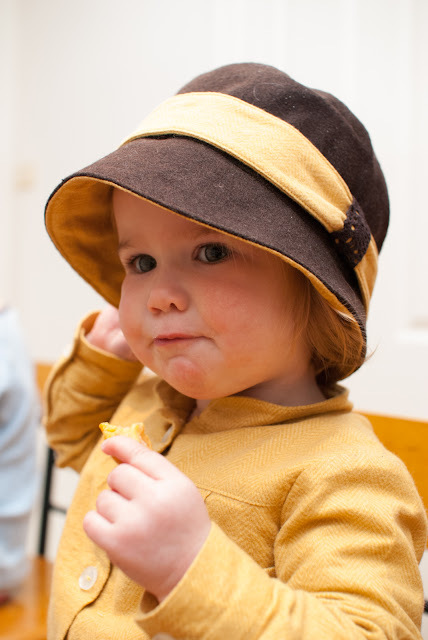 Glad to hear your daughter was happy with this hat, because it is oh so cute! Love how it matches her coat. I had a look at a few images from the book you mentioned and I now think I must have it! On a side note... Naughty kitty!! Jenya it's a fabulous book. Go for it. Lots of cute inspiration for your cold winter locale! Darling hat and coat ensemble! I must look for that book! Thanks Karen! I'm really loving the fit and styling of some Japanese pattern books. This one is a gem.